Photo Courtesy of Weekend With Bernie. 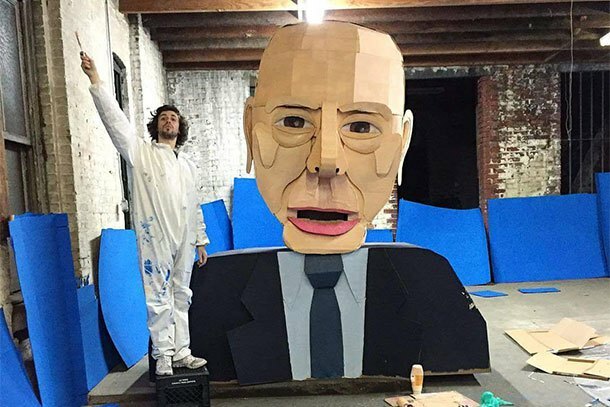 Artist Matt Starr with Giant Bernie, Photo Courtesy of Weekend With Bernie. In preparation for Weekend with Bernie, an art show to benefit the presidential campaign of Vermont senator Bernie Sanders (perhaps you've heard of him? ), a group of Bushwick-based artists is making a giant likeness of him. Know that this isn't specifically "Bernie Man" before you start soliciting high fives for making that pun, but go ahead and enjoy it, if you want. 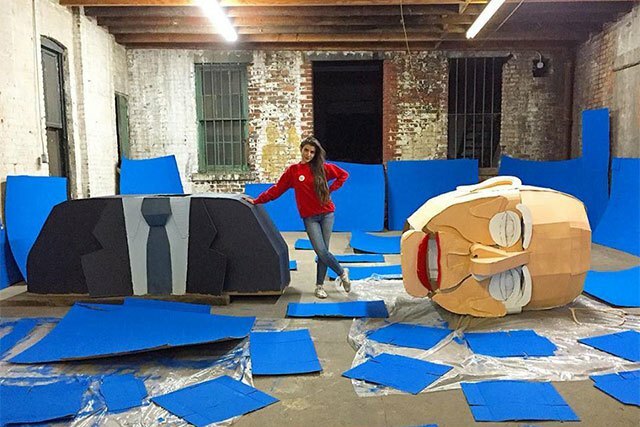 Giant Bernie, whose mouth is going to be loaded with a paper shredder into which attendees can stuff their student loans, will be one Sanders-themed work among many at Brooklyn Wayfarers gallery in Bed-Stuy this weekend: other featured works will include an appearance by Sesame Sanders, a Bernie-inspired muppet-style puppet and a "blue marble" style photo of the earth styled with Sander's distinctive frizzy white hair. "[The goal of the show] is to excite young people to vote," co-curator Brittany Natale tells Bushwick Daily. "Voting is fun! I know a lot of people who don't even bother, and if you have the right, you should use it." Natale with Giant Bernie. Photo Courtesy of Weekend With Bernie. Natale (Who is a Bushwick Daily contributor) is co-organizing the show with Matt Starr, the progenitor of "babycore." Other featured artists include Ryan Hemsworth, Molly Crabapple, Liberty Leben, Grayson Earle, Adam Kurtz, Clio Sage, Ryder Ripps and more. A doctor will be on hand to provide "free health care" at the opening, and both a gospel choir and a Brownsville-based marching band will be performing. And of course, because millenials in Brooklyn, there's a condom sponsor, a kombucha sponsor, a doughnut sponsor, a matcha sponsor and a sponsoring company called Bearded Brothers (not those bearded brothers, though), whose donated goods will be available to attendees in a "Bernie Bodega'. The show opens Friday, February 12th with events from 7pm-12am and features more events on Saturday, February 13th, from 11am-11pm. Brooklyn Wayfarers is located at 1109 DeKalb Avenue between Broadway and Malcolm X Boulevard in Bedford-Stuyvesant. There is no suggested donation rate.